Morgan Schild races down the moguls course on Thursday at the FIS Visa Freestyle International Ski World Cup at Deer Valley Resort. 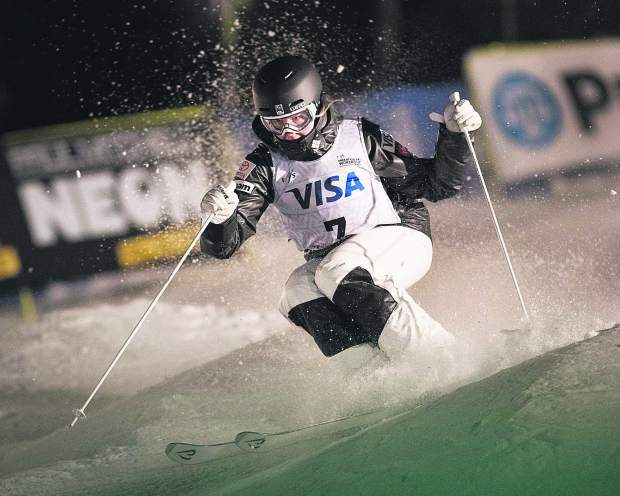 Schild took first during last year’s World Cups at Deer Valley, and took third in both of this year’s competitions on Wednesday and Thursday. Schild came off a knee injury last season and said, though Deer Valley wasn’t specifically marked in her mind as a point of return, it’s an auspicious place for her. “I know that I really like this course — I like being home, I like having my family cheering me on, and honestly thinking that my mom was at the bottom cheering me on really helps me keep it together and allow myself to lay down my run,” she said. With her podiums, she qualified for the U.S. Olympic moguls team.